The band was formed out of the Bradford and Leeds City Police Bands when in 1974 the Leeds and Bradford Forces amalgamated to form part of The West Yorkshire Metropolitan Police. The bands merged to become The West Yorkshire Police Band. Initially the Band was military in style, with woodwind, brass and percussion it wasn't until 1984 a new ethos was agreed and since then the Band has been styled in the traditional Brass Band format. Originally comprised solely of serving police officers, the band now draws from the wider police family, retired police officers and members of the public. 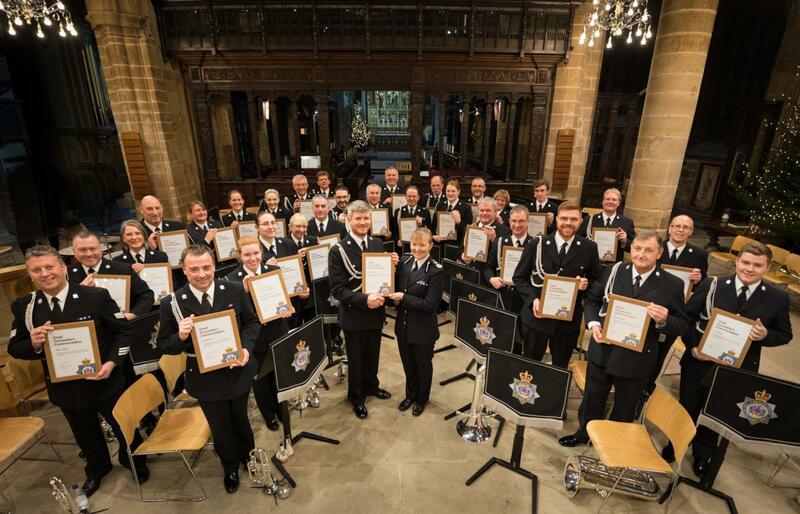 The band has one of the largest number of regular volunteers for West Yorkshire Police contributing an average of 4500 volunteering hours each year. Since its inception, the Band has entertained audiences across West Yorkshire and the UK and, more recently, as its reputation has grown it has reached an international audience. All appearances are made with the permission of the Chief Constable. We have been guests of the Last Post Association in Ypres, Belgium since 2004 and performed at the Last Post Ceremony under the Menin Gate and Remembrance Ceremonies in and around the Ypres area. We took part in D-Day commemorations on the 65th and 70th Anniversaries at Pegasus Bridge - a pivotal point in the D-Day landings - and appeared in concert at venues in the Normandy area. In 2016 we were part of the Olympic Homecoming Parade in Leeds. In 2006 our Fanfare Trumpeters played at Wakefield Cathedral for the visit by Her Majesty the Queen to distribute the Maundy Money, just one of several occasions that the band has played for Her Majesty. Our fanfare trumpeters perform at a variety of ceremonial events including the annual opening service for The North Eastern Circuit of Judges, Magistrates and Members of the Legal Profession at York Minster. We were privileged to be invited to New York on two occasions to help commemorate the 5th and 10th anniversaries of 9/11. In September 2006 on the 5th anniversary, the Band played at the site of the British Memorial Garden, Hanover Square in Manhattan. Whilst in America the Band also performed for the local community of Long Valley, New Jersey who kindly provided members of the band with accommodation during their stay. In September 2011 for the 10th Anniversary, we were invited back to New York. The Band played in concerts at the Fairleigh Dickinson University in New Jersey and the New York Police Department Museum in Lower Manhattan. On 9/11/11 the Band returned to play at the British Memorial Garden in Hanover Square, along with the Allied Forces Pipes and Drums and the combined choirs of Tayside Police, Lothian & Borders and In Chorus. The West Yorkshire Police Band primarily performs for the entertainment of the community within West Yorkshire. Our concert programme varies from classical to rock; solemn to uplifting and caters for all tastes. As a full brass band we have around 25 to 30 players but can also provide smaller ensembles which is ideal for smaller venues or occasions. We are also available to lead and be part of Civic and Ceremonial Parades. We can also provide a fanfare trumpet team in full regalia, adding a musical flourish to any grand event or ceremony. We have, and can also supply, buglers for Last Post engagements throughout the county.